Available as low as $19.45 per bar over spot! Gold bullion coins might be gaining in popularity, but it is still hard to beat the value and availability of gold bars. 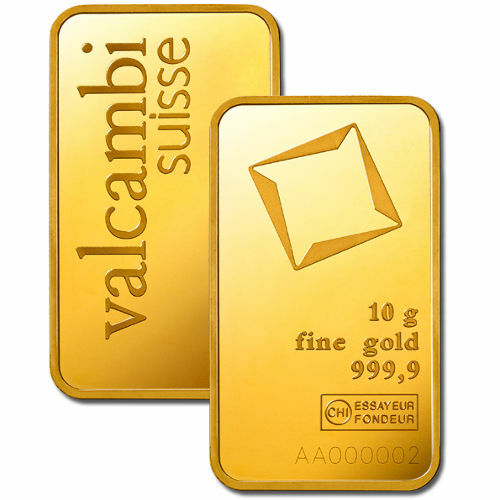 Valcambi Suisse is one of the largest global brands for precious metals production, and their gold bars always contain .9999 fine gold content. 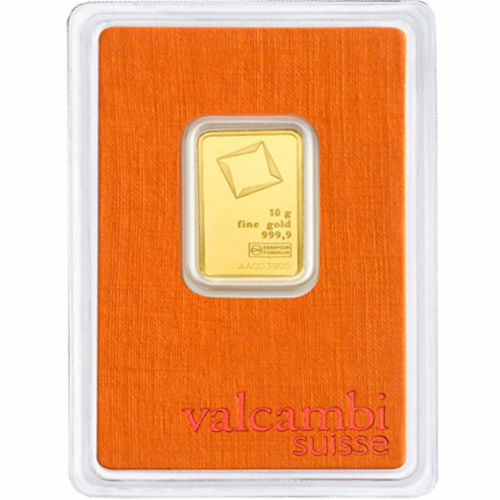 Today, Silver.com offers the 10 Gram Gold Valcambi Bar in brand-new condition. More and more often investors are buying gold in grams to meet their needs because of its divisibility. The gold price per ounce can be divided by 31.1 grams to get price per gram. Ships in sealed plastic with blister-proof technology. Consists of 10 Grams, or .3215 Troy ounces, of .9999 fine gold. Obverse includes the mint logo and refining details. Reverse bears only the refinery’s name. Privately produced at Valcambi Suisse. Although minted ingots and bullion coins go through similarily complex production processes, there are other differences that keep the price of 10 Gram Gold Valcambi Bars and other products lower than popular gold bullion coin programs. The most important factor is availability. While most coin programs, such as the Gold American Eagle or Gold Canadian Maple Leaf have limited mintages each year, there is no real set limit for the production of Gold Valcambi Bars. The greater availability makes it easier for more investors to purchase these products. 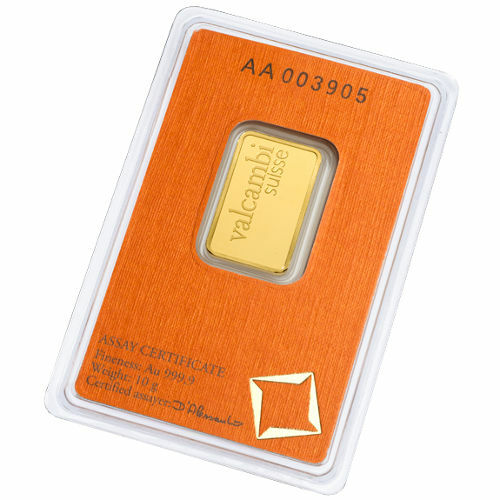 Each of the 10 Gram Gold Valcambi Bars available to you through Silver.com today are brand-new products. Each arrives sealed in a blister-proof plastic package that includes the refinery’s trademark orange assay card, which validates the assayer’s mark, weight, purity, metal content, and individual serial number of your product. The reverse side of all Gold Valcambi Bars includes only the refinery’s name. Arranged vertically along the lefthand side, it reads “Valcambi Suisse,” and is situated running from the lower left up to the upper right of the bar’s reverse face. On the obverse of each 10 Gram Gold Valcambi Bar you’ll find the refinery’s logo, along with engravings of the weight, metal content, and purity. At the bottom are the assayer’s mark and the individual serial number. All Valcambi bars in this range have two-letter, six-number coded serial numbers. Valcambi Suisse is one of the world’s most recognizable precious metal brands. Located in Balerna, Switzerland, it was originally founded as Valori & Cambi, and gained its now-famous name through a 1968 acquisition by Credit Suisse. Please don’t hesitate to reach out to Silver.com with questions. You can reach our customer service staff on the phone at 888-989-7223, online using our live web chat, and via our email address. Please also look around at our other gold bar offerings by visiting our gold bar section.